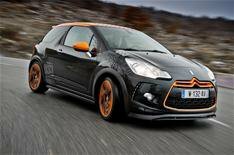 Citroen DS3 Racing driven | What Car? If you like the lairy-looking Citroen DS3 Racing, you'd better get in quick. Only 200 are coming to the UK, of which around 100 have already been sold. It's not just the racy looks that have got hot hatch fans interested in Citroen's performance version of the DS3, either it's also got something to do with the reworked suspension and fire-breathing turbocharged engine. In short, great fun. The turbocharged 1.6-litre petrol engine produces 204bhp and 203lb ft of torque and the 0-62mph dash takes just 6.5 seconds, and it'll keep boy racers happy. You will notice one or two small flat spots as you tear through the rev range, but the engine is flexible and it sounds terrific. Top speed is 146mph. With all that power being transferred to the road through the front wheels, it's no surprise that the steering wheel writhes around a bit of its own accord when you accelerate hard. The front wheels can occasionally scrabble to find traction, too, but once you're off and running, you won't be able to stop smiling. The Racing has a reworked suspension with a wider track than the standard DS3, lowered ride height and recalibrated springs and dampers, so it feels crisp and focused. Grip is strong, body control is tight, and the car always feels balanced and predictable in bends. The steering is direct and has a meaty-feeling weight to it, and it also gives you a reasonable amount of feedback to work with. True, the ride can get decidedly jiggly on a scruffy surface, but it's nothing that hardened hot hatch fans can't live with. The standard DS3's cabin is pretty smart to start with, with appealing materials and an interesting but user-friendly design. The Racing adds an extra splash of sportiness to the mix, though, with Alcantara bucket seats, a lairy colour scheme, racing dials and drilled aluminium pedals. Apart from the extra style, though, the Racing is just like any other DS3 inside. The cabin is big enough to accommodate four adults (provided that those in the back aren't too tall), but Citroen's claim that it's a full five-seater is somewhat optimistic. The boot is a decent size, though, and you can drop the rear seats for more cargo space if needs be. Here lies the snag. The DS3 Racing will set you back brace yourself 23,100. That's a lot for what is still, no matter how fast it is, a supermini with a Citroen badge on it. It looks even pricier next to cars such as the superb Renaultsport Clio 200, which has more dynamic finesse, yet is available for around 17,000. However, the thing that really puts the pricetag into perspective is this for what you pay for the DS3 Racing, you could have a low-end BMW 3 Series. Ouch. Still, you get plenty of kit for your cash, including climate and cruise controls, Bluetooth, parking sensors and automatic lights and wipers. Running costs shouldn't be too crippling, either, with fuel consumption of 44.1mpg and CO2 emissions of 149g/km. The group 32 insurance grouping may cause problems for younger drivers, though, and despite its exclusivity, we don't expect the Racing's resale values to be any better than average.